Drops in delinquency and net charge-off rates indicate a likely turning point in asset quality rather than a one-quarter hiccup. Asset quality is improving at credit unions as delinquency and charge-offs turn the corner in this post-recession economy. Further, stronger allowances and positive trends in the one-to-two month delinquency rate signify credit unions have less to fear from potential loan losses in 2010. 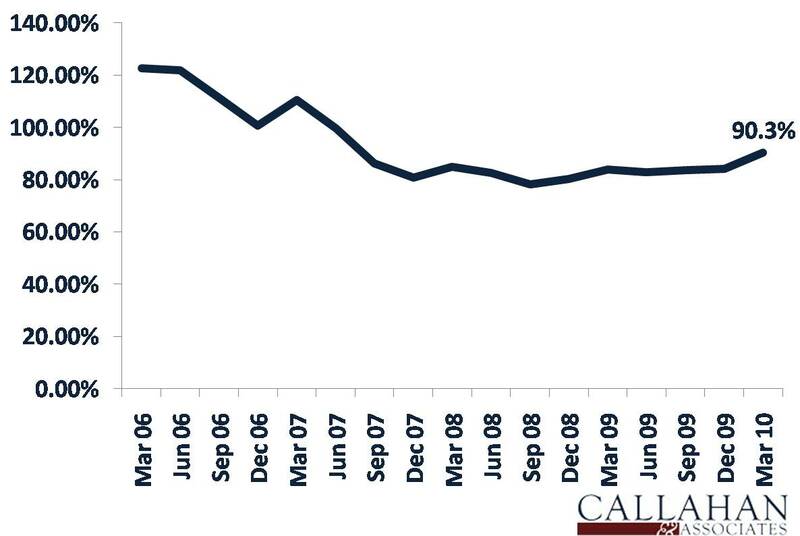 According to Callahan & Associates’ FirstLook program, which includes data from 98% of the industry by assets as of March 31, 2010, the delinquency and net charge off rates fell 6 basis points – to 1.76% – and 2 basis points – to and 1.19% – respectively. 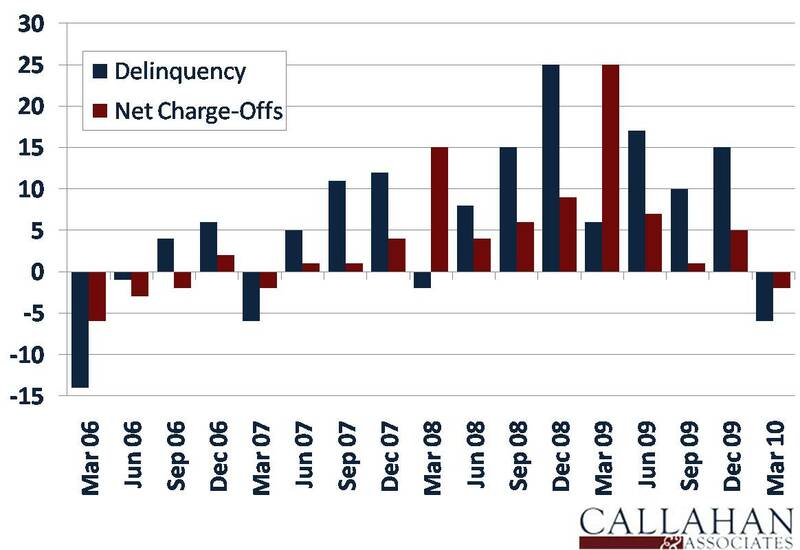 Decelerating delinquency and net charge-off rates through 2009 means the first quarter results are likely a turning point in asset quality rather than a one-quarter hiccup. Further, this quarter-over-quarter decline signifies a return to seasonal asset quality trends. This seasonal trend disappeared as the country entered the recession, leading to seven consecutive quarters of delinquency growth and 11 quarters of growth for the net charge-off rate. The return to seasonal trends signifies a return to normalcy, perhaps the strongest sign of stabilization. The net charge-off rate typically jumps at year-end as credit unions clean their balance sheets for the New Year, leading to a first-quarter dip in delinquency. Credit unions have been reluctant to charge-off delinquent first mortgages, causing the delinquency rate to climb to 2.20%. However, other real estate delinquency is down from fourth quarter 2009, to 1.58%. 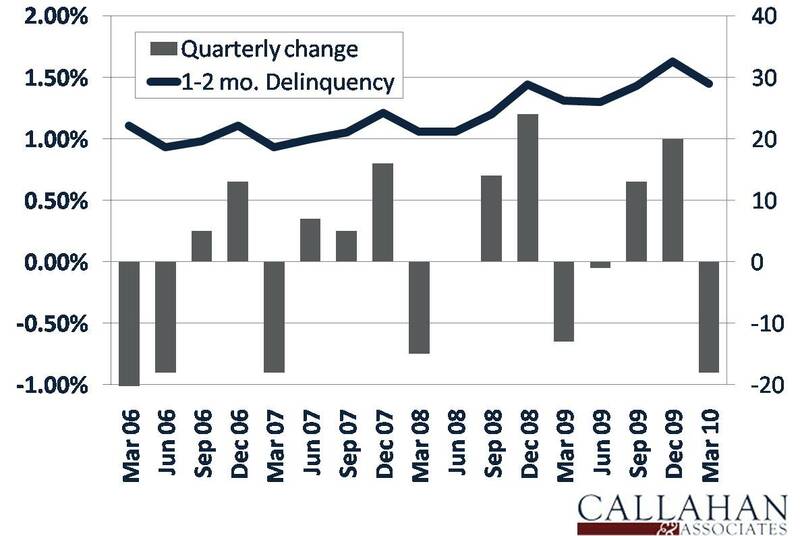 Consumer loan delinquency is also down, led by a 16 basis point drop – to 1.90% – in credit card delinquency. Credit unions have been the safe and sound financial institutions of the Great Recession. One of the most significant indicators of this soundness is the coverage ratio, or the portion of delinquent loans covered by current allowances for loan losses. While this ratio falls at banks (down to 58% at the end of 2009), it trends upward at credit unions, who are rebuilding their reserves. Annualized provisions for loan losses as a percentage of average assets peaked at 1.11% at the end of 2009. Paired with the decline of net charge-off rate in the first quarter of 2010, allowances grew 3% quarter over quarter to $8.99 billion in the first quarter for the FirstLook peer group. As the delinquent loan portfolio contracted 4% quarter over quarter, the coverage ratio leapt from 84.2% to 90.3%. Additionally, trends in non-reportable delinquency suggest this ratio might continue to improve. The past three quarters have yielded slower growth in one-to-two month delinquency rates than in the previous year. The fourth-to-first quarter decline is comparable to prerecession seasonal trends, again signifying a return to normalcy and an indicator of future stability in reportable delinquency. Second quarter will provide a better picture of whether asset quality has truly turned the corner, but these various metrics suggest credit unions have less to fear from future loan losses than in previous quarters. For more on 1Q 2010 asset quality trends, read Understanding Member Challenges Helps Stamp Out Spring Delinquency and Data Snapshot: State-Level Asset Quality for 1Q 2010.